Environmental management (EM) is the process of managing the environmental issues associated with an organisation’s activities. There is no one definition for EM, but, in general, it can, be said to encompass all the activities and technologies necessary to manage an organisations environmental performance. An environmental management system (EMS) is the term used to describe the overall management system a firm can use to integrate environmental issues within the existing management and operating systems, thus enabling the company to conduct its activities while ensuring the associated environmental impacts are managed. Environmental management is based on the concept of continuous improvement of an organisation’s environmental performance over time. In this way, an EMS is continuously changing in line with the organisation’s activities as well as external influencing factors such as environmental legislation, changes in technology, and market pressures. This dynamic nature allows organisations to improve their environmental performance at a rate and to the level relevant to them. The structure of an EMS is defined in the standard ISO 14001 or by the Eco-Management and Audit Scheme (EMAS). Companies that develop an EMS in line with either or both of these systems can have the system certified and hold a third party accreditation for it. The benefit of an accredited EMS is that is demonstrates that a company is managing its environmental performance in line with internationally accepted schemes. More and more firms are finding this is a business benefit. EMAS and ISO 14001 are typical examples of the shift in environmental policy away from the traditional ‘command and control’ environmental legislative instruments to the use of voluntary schemes and market-based instruments. Furthermore, in support of the concept of sustainable development, EMAS and ISO 14001 provide a new approach for controlling environmental issues. ISO 14001 – Environmental Management Systems – Specification with guidance for use (ISO 14001; 2015) is an international standard that specifies the content of an EMS. An EMS that meets this specification may certify to the standard and avail of the associated benefits. Guidance on developing an EMS, but not necessarily for certification, is detailed in another international standard ISO 14004: 2016 Environmental management systems — General guidelines on implementation. 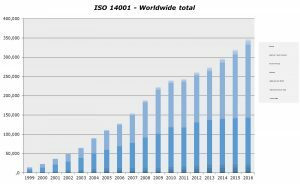 ISO 14001 was first published in 1996, it was revised in 2004 and again in 2015. ISO 14000 is a suite of standards and guidance documents on a range of topics relevant to the environmental management of industrial processes and products. The Eco-Management and Audit Scheme (EMAS) is a management tool for organisations to evaluate, report and improve their environmental performance. The scheme has been available since 1995 and was revised in 2001 – Regulation (EC) No 761/2001 and 2009 . The current EMAS specification is defined in Regulation (EC) No 1221/2009 (“EMAS III”) and came into effect on 11 January 2009. Unlike many EU Regulations, there is no legal obligation to use EMAS; it is available for adoption on a voluntary basis. EMAS is an environmental management scheme, whereby organisations develop an EMS (to ISO 14001 or in line with the EMS specified in EMAS) and an externally verified Environmental Statement as per the provisions of the EMAS Regulation. This enables them to register under the EMAS whereby they may use the EMAS logo and become listed in the Register of EMAS sites. EMAS is open to all industry and economic sectors. Participation extends to public and private organisations operating in the European Union and the European Economic Area. More than 4,000 organisations and approximately 9,200 sites are EMAS registered worldwide (Source: EMAS -Statistics & Graphs). Any site in possession of an Integrated Pollution Prevention and Control (IPPC) License, Industrial Emissions License or a Waste License from the Irish Environmental Protection Agency (EPA) is required to develop an EMS for the management of all environmental issues. 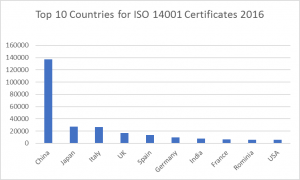 There is currently no requirement within the licensing systems to achieve certification to the ISO 14001 standard or to EMAS; however, many licensed companies see certification of the EMS as an added benefit. Condition 2 of the license defines the requirements for the EMS. While the specific components of an EMS (as defined under the ISO 14001 specification, EMAS Regulation or in a license) may vary, the general structure behind the EMS concept is largely the same. The components of a typical EMS are illustrated in the diagram below. A typical EMS incorporates the following elements. 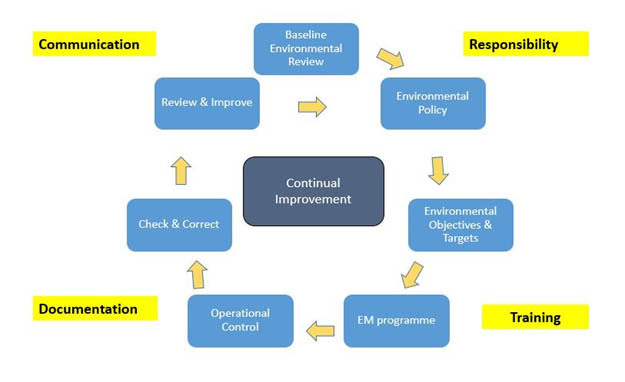 At the beginning of an EMS development, a baseline environmental review/audit is normally conducted in order to determine the status of the organisation’s environmental performance. This audit should feature a comprehensive identification and evaluation of all the significant environmental impacts and issues relevant to the organisation’s activities at the site. The size of an audit and time scale for conducting it will largely be determined by the size of the organisation and complexity of the site activities. For EPA licensed sites, the collation of data and completion of the application process is largely similar to conducting a baseline environmental audit. The issues to be considered in an audit will vary depending on the organisation, its location and the type of activities conducted. Audits are normally conducted via site surveys, discussions with relevant site personnel and other third parties as relevant. Depending on the site requirements, environmental monitoring of, for example, surface water, groundwater, soil or air may be conducted. The baseline audit should be comprehensively documented as it provides the basis for the development of the remaining EMS components. There are currently three international standards in the ISO 14000 suite (ISO 14010 – 14012), providing guidance on environmental auditing. Based on the findings of the Baseline Environmental Review/Audit, the environmental improvements necessary should be clear. The next phase is to plan a way forward for ensuring that improvement measures are implemented in a realistic and timely manner. This involves specifying an Environmental Policy, defining objectives and targets and devising an Environmental Management action Programme. Based on the audit, an environmental policy statement is developed to define the overall environmental aims of the company. This is typically a one-page statement, stating the actual, realistic (not aspirational) environmental aims, committed to by the senior management and signed off by the head of the company. Based on the audit, a schedule of objectives and targets is established for a specified time scale, following on from the policy. Initially, the objectives are largely based on environmental legislative requirements, such as the conditions of a license, where these are not already in place. As the aim is to improve environmental performance over time, objectives and targets will be revised and updated over time, in light of license reviews, site requirements etc. Finally, the EM Programme is developed as an action plan for achieving the objectives and targets. It includes information on the means, time-frame and allocation of responsibility necessary to achieve these. Implementation of environmental monitoring programmes as defined in relevant licenses or in line with best practice. As environmental impacts can occur as the result of an emergency situation at an industrial facility (e.g. spillage of a hazardous substance, fire generating contaminated fire water or explosion releasing a toxic gas), these potential scenarios are identified and appropriate control measures are put in place to limit and mitigate the likely environmental impacts. Within the EMS, the role of an Environmental Manager/Officer for the site is allocated. This person champions the EMS development and takes responsibility for the day-to-day running of the EMS once implemented. Specific requirements for site management and staff as required under the license would be incorporated in this section of the EMS. Procedures for identifying the environmental training needs of personnel and providing training as relevant are put in place. A programme is developed to ensure appropriate internal and external communications regarding environmental issues relevant to the site. This incorporates all relevant stakeholders and should ensure appropriate access to information on the organisation’s environmental performance is made available. Typically, the Environmental Policy Statement is used to disseminate information to the public on the company environmental aims. Dependant on license requirements, a variety of environmental performance data, such as environmental monitoring data, records and annual environmental reports are made available to the Regulatory Authority and are in the public domain. It is increasingly common for companies to include environmental performance information in Annual Reports, provide specific Annual Environmental Reports and include environmental information on their websites. Checks are normally conducted on an on going basis to ensure that the EMS is operating effectively and to ensure corrective action is taken if EMS elements are not appropriately implemented. Inherent in the EMS concept is the requirement for on-going assessment of operations with a view to improving environmental performance over time. Once the EMS is operational, reviews are conducted at a suitable frequency in order to ensure the on going suitability and effectiveness of the EMS. After the review process, the Policy Statement, Schedule of Objectives and targets, EM programme and other aspects of the EMS may need to be updated. This review will not normally be as comprehensive as the baseline environmental review, but many of the same issues will be considered. To facilitate implementation, the essential elements of the EMS are documented in electronic or paper-based format. This may be in the form of an Environmental Management Manual and as part of the existing site operational documentation. As resource conservation is likely to be a key aim in an EMS, the documentation should not be highly paper intensive. Up to the end of December 2016, at least 346189 ISO 14001 certificates had been issued in 201 countries worldwide. 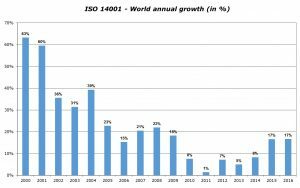 Ireland had 750 ISO 14001:2004 and 180 ISO 14001:2015 issued.